Indicate start and finish dates and times. If task start depends on another task being finished, start date and time will be pre-populated. Set up task in your time zone, resources will get it in their own. Set task as a Milestone or Urgent. Select if the task must be performed at a certain date or if it can be affected by previous tasks delays or early deliveries through Task Rescheduling. Select if the task will be activated automatically once the previous task is delivered through Task Hand-Over. Add Source & Reference files. If the task comes after another one (dependent) you can even select to have the delivered files of the first one be automatically assigned as Source files of this one! If your company is the Owner of this project, you can select yourself, a member of your team or an external partner as the Resource. If this project was sent to you by a client, you can choose to create this task with them being its Owner and your, or your team, as the Resource. Assign a task to an internal team member, a freelancer or the employee of a partner company. Your external partners get tasks from within their own accounts, they're not just a user in yours. Even if your project has hundreds of tasks, they will only see the ones you assigned to them. Review your team's previous comments and ratings for that external individual before assigning the task. Review past tasks your company has assigned them in the past (Administrator's view only). 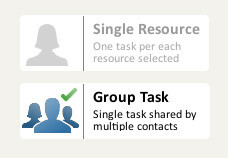 Generate multiple identical tasks that will be sent individually to multiple resources. Only you, the resource and your internal administrators will have access to that task. If the resource is an external partner, her administrators (if any) will also be able to see that task. 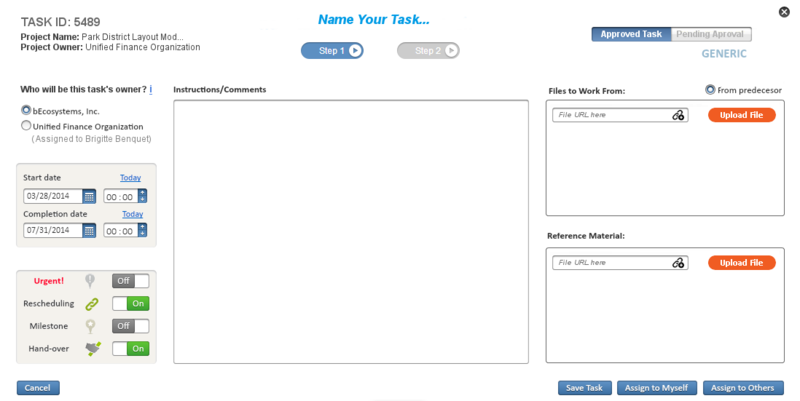 Assign a task to a group of resources. In this scenario, you can easily select multiple resources that will all share responsibility for that task. You might be getting ready to start a four-task project or the construction of a hospital. In either case, it’s possible you only want to notify collaborators till you’re sure the project phases and deadlines are well defined. 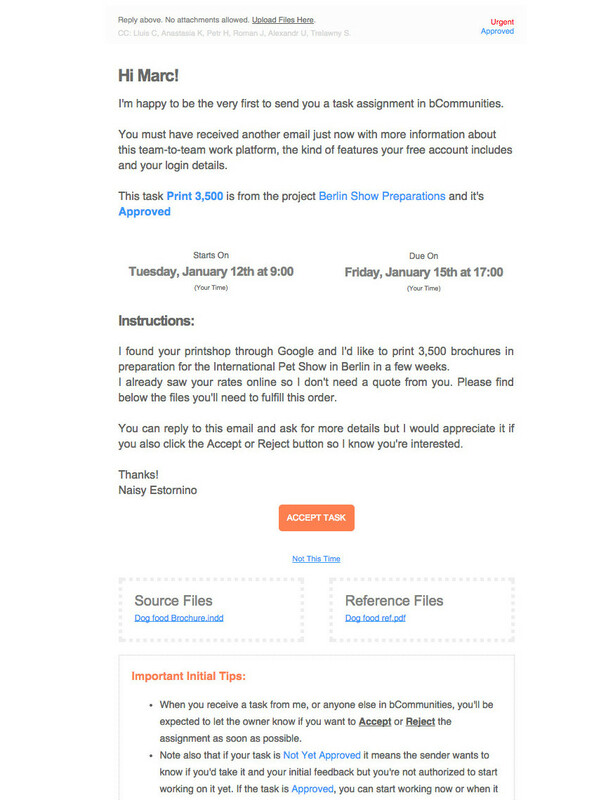 Setup tasks, pre-assign resources and notify them as you register the task or later. One by one or send notifications in batches. Wanna keep track of a request to print your brochures in a Berlin printshop you just found online? Done! Get their email address and basic contact information. Setup the task to send them and just add them as a resource right from there. 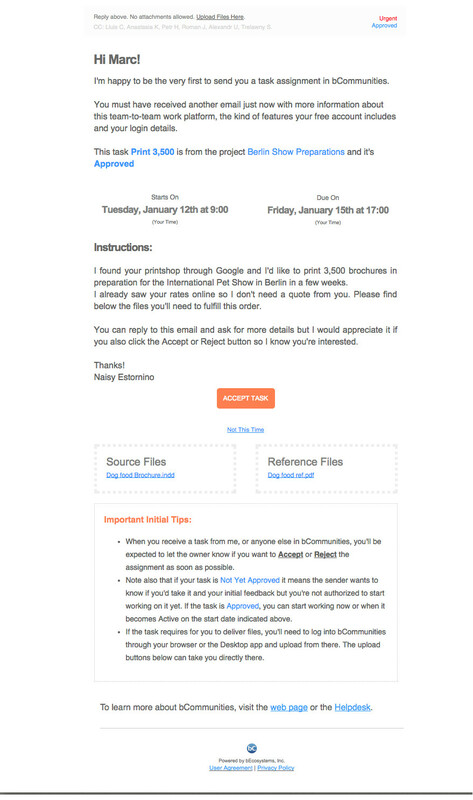 They will receive an easy to understand email notification with your task that they can Accept or Reject. As your collaborators, they will get a free forever Light Edition account so you can send them work as needed.